Swans but rarely appear in Hočąk stories, and then usually as messengers on account of their strong voices and pure white plumage. A swan was one of the three messengers to the spirits chosen by Hare. The swan was to present tobacco to the spirits and invite them to the foundation of the Medicine Rite. When the swan returned, it was so old that it looked like a worn out moccasin. It made the four circuits of the interior of the lodge, then moved to the center, where it kicked up dust in the four directions. Then the swan shook itself, and miraculously it recovered its youth and beauty. Its rejuvenation symbolized how the initiates of the Medicine Rite would be able to gain for themselves all the Life which they could possibly obtain.1 At another time when Hare convened an emergency council of the Great Spirits, a white swan was called upon to be one of the messengers to the spirits of the air.2 Both of these swan were termed "cackling" or "shrieking" swans (heǧwamǫke), their voices making them perfect choices as messengers. Links: Bird Spirits, Celestial Spirits, Polaris, Hare, Bluehorn (Green Man). Stories: mentioning swans: The Green Man, The Messengers of Hare, The Twins Retrieve Red Star's Head; mentioning the Medicine Rite: The Medicine Rite Foundation Myth, The Messengers of Hare, Maize Origin Myth, The Necessity for Death, Hog's Adventures, Great Walker's Warpath. 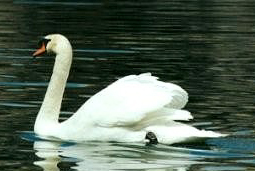 Themes: a swan is sent to the upper world as a messenger: The Twins Retrieve Red Star's Head, The Messengers of Hare; something is of a (symbolic) pure white color: White Bear, Deer Spirits, The Journey to Spiritland (v. 4), White Flower, Big Eagle Cave Mystery, The Fleetfooted Man, Thunderbird and White Horse, The Orphan who was Blessed with a Horse, Worúxega, The Two Boys, The Lost Blanket (white spirits), Skunk Origin Myth, Eats the Stinking Part of the Deer Ankle, White Wolf, A Man and His Three Dogs, The Messengers of Hare, The Brown Squirrel, Bladder and His Brothers, White Thunder's Warpath, The Dipper. 1 Paul Radin, The Road of Life and Death: A Ritual Drama of the American Indians. Bollingen Series V (Princeton: Princeton University Press, 1973 ) 82-84. 2 "The Epic of the Twins, Part One," in Paul Radin, The Evolution of an American Indian Prose Epic. A Study in Comparative Literature, Part I (Basil: Ethnographical Museum, Basil Switzerland, 1954) 24-41. 3 Paul Radin, "The Blue Man," Winnebago Notebooks (Philadelphia: American Philosophical Society) Notebook 55; Paul Radin, (untitled), Winnebago Notes (Philadelphia: American Philosophical Society) Freeman #3858: 4-16. 4 Mary Carolyn Marino, A Dictionary of Winnebago: An Analysis and Reference Grammar of the Radin Lexical File (Ph.D. Thesis, University of California, Berkeley, December 14, 1968 [69-14,947]) s.v. hex. 5 Rev. James Owen Dorsey, "Winnebago Gentes, including Personal Names Belonging to each Gens" (National Anthropological Archives, Smithsonian Institution: T.D., 1878-79? ), cat. #4800 Dorsey Papers, Winnebago (319); Paul Radin, The Winnebago Tribe (Lincoln: University of Nebraska Press, 1990 ).